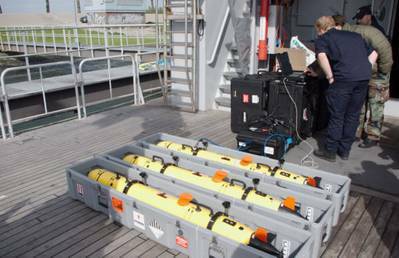 The Royal Netherlands Navy (RNLN) has integrated SeeByte’s Neptune software into its new generation Remus 100 fleet of autonomous underwater vehicles (AUV). Neptune provides a payload control architecture, goal-based mission planning, and real-time autonomy engine for Unmanned Maritime Systems (UMS) to plan and execute well known patterns of behavior. Neptune expedites and optimizes single-vehicle and multi-vehicle operations. Neptune can be used to coordinate fleets of unmanned assets for MCM missions enabling operators to easily coordinate various assets to search, classify and map, reacquire and identify operations as part of a single mission. By combining all the mission plans and monitoring in a single work station and user interface, teams are able to manage larger fleets of unmanned assets without putting additional strain on the operators.